Everybody in my family, except Eilene, loves mushrooms. She doesn’t like the texture. This leaves me with three options when I use them in cooking. I can chop or grind the mushrooms into a form that she will not recognize. Eilene will happily eat mushrooms, as long as she is not aware she is doing so. I can cut them into large pieces that she can easily pick out of her food. Or finally, I can cook a separate mushroom dish for those of us who really like mushrooms. Note: I made this to go with my French Braised Pork. 1. Rehydrate the wild mushrooms in one cup of warm water for 20 minutes. Squeeze dry and chop coarsely. 2. Trim and coarsely chop the Crimini mushrooms. 3. Trim and break larger oyster mushrooms into bite sized pieces. 4. Chop the green onions, Separate the white and green parts and set them aside. 5. Melt 2 tablespoons of butter in a large sauté pan and cook the mushrooms until they are starting to pick up a fair amount of color, about 7 to 10 minutes. 6. Pull the mushrooms to the sides of the pan and add the rest of the butter. 7. When the butter has melted, add garlic and the white parts of the onions. Sauté for one minute and add the mushrooms. Continue sautéing for 2-3 minutes. 8. Add the rum, lemon juice, tarragon, and black pepper to the pan. Cook for one minute to meld the flavors and toss to coat. Continue cooking for another a minute or two until most of the liquid has evaporated. 9. Add the most of the green onions and sprinkle with a pinch of salt, toss to mix. Tip: Reserve about a third of the green onions as garnish. 10. 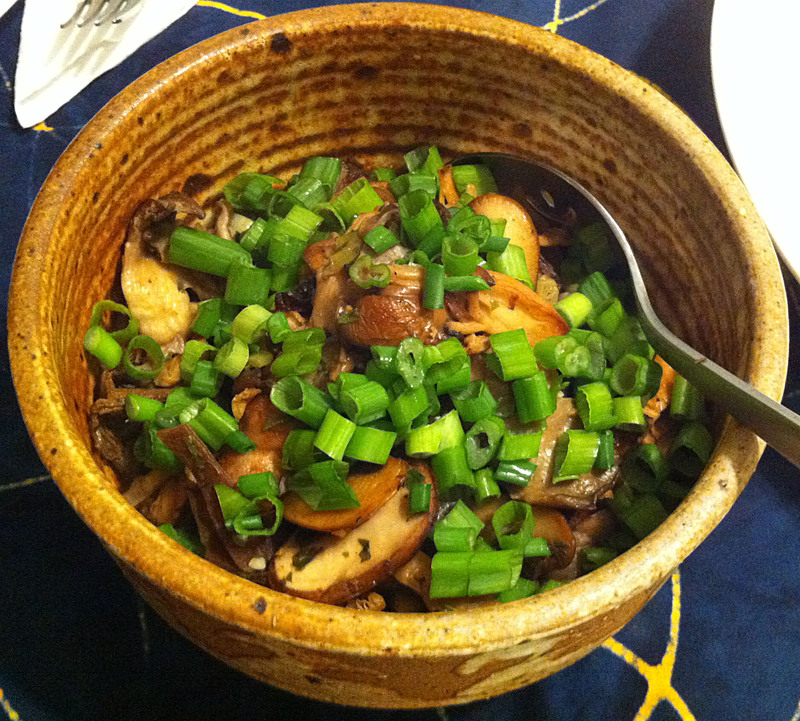 Transfer the mushrooms to a serving bowl and garnish with the reserved green onions. Thanks for sharing your yummy recipe.